First time for me to cross post something but the more I think about the New Horizons Pluto expedition the more marvelous it seems. Friday evening I got a text from Kate McKinnon asking if I'd be interested in coming to Maryland and photographing the scientists behind the New Horizons Pluto expedition, essentially, immediately. At the time I was out at dinner with trillian_stars. "Do you want to go?" Trillian asked. "No," I said, "I'm really tired. But I know I'll want to have gone when I get back." I've learned that over the years. It's not how you feel about it at the time, it's how you think you'll feel about it next week. We raced home and I threw a bunch of stuff in camera bag and jumped on a train. On the train I called Jordan Teicher from SLATE and asked if they'd be interested in running it if I could get a series of portraits. He said they's push everything out of the way for it, and then there was no turning back. Camera Geekery: Leica M9, 50mm Canon Serenar, 28mm Voigtlander f2, 35mm Voigtlander f1.7, Panasonic GX7 (backup), Pocket Wizards, Lastolite triple-fold umbrella flash, batteries, two lights stands, Kindle, Paper notebook, Monteverde Intima fountain pen, card reader, collapsable backdrop. Kitten optional. 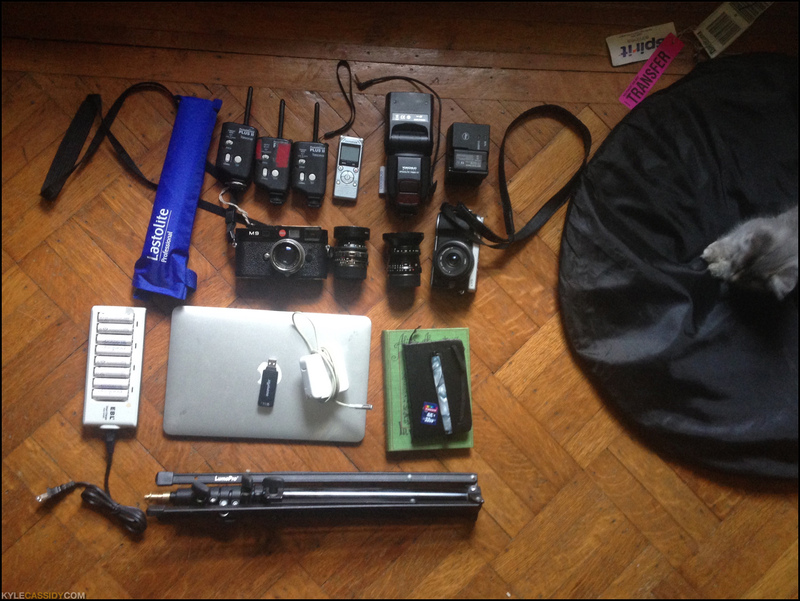 I used everything but the two extra Leica lenses. You may clickenzee to embiggen. I went to bed late and got up early. Everybody else got up early too. For the scientists at the Applied Physics Laboratory the day starts with an early morning briefing where each of the five teams discuss what they've learned the night before. After the meeting, they go off to work on all the things they have to do and in between, Kate would catch people and bring them over to the small studio the Laboratory was kind enough to let me set up near the lobby. Everybody, in fact, was super nice. 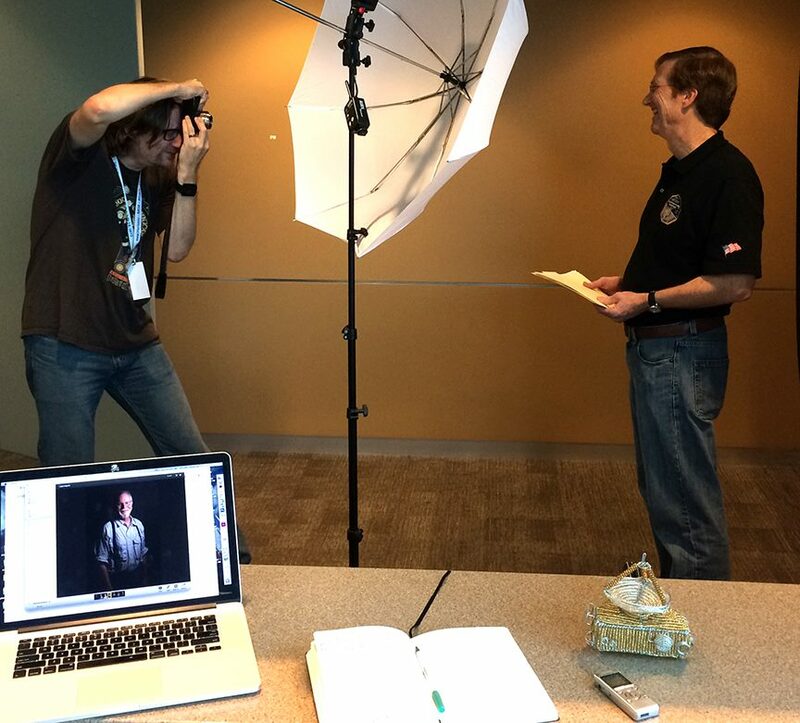 Behind the scenes, photographing Dr. Hal Weaver. Kate did interviews, I grabbed portraits while people scurried from one place to another. I had usually between a minute and two minutes with everybody. Kate did quick interviews. It's a very simple setup with a single shoot-thru umbrella and a Leica M9 rangefinder camera. Later in the day there was a recap for the public about the most recent findings (if you've been watching on TV or the Internet, this is likely what you've seen.) Kate and I sat down in the front row in the press section and I started working on processing the morning's images. About 15 minutes after it started, Brian May (aka Dr. Brian May, astrophysicist, AKA Brian May guitar player from Queen) and Casey Michael Lewis from the Applied Physics Lab sat down next to us. That's just how things happen. Plutopalooza with Brian May & Kate McKinnon. The Applied Physics Lab let me set up another studio in a classroom and Kate went out and found all the key scientists and brought them in. They're all amazing people, and that's -- I mean, that's nonsense talk to say "amazing" it's like calling a mountain "big" -- it's just the only thing I can think of because my brain overloaded thinking about the scope of what they'd done. These people, starting 15 years ago with an idea, built a space probe, built a rocket, figured out where a planet nobody had ever seen a full orbit of was going to be in a decade, shot this thing into space and it hit it's target and -- it sent back data to Earth, from three billion miles away. I don't know what to call it -- I'm just dumbstruck. But in any event, they're all amazing, but my brain melted when I met Yanping Guo, the "trajectory designer", which is a really elegant phrase for the most elegant job I've ever heard of. She's the one who figured out where to shoot the rocket to hit Pluto ten years later, and not in a straight line. You can see the trajectory of New Horizons here in this animation -- it uses the gravity of Jupiter to help give it more speed and fling it into space. While she was talking about what she did my jaw just kept dropping further down. One of the things she had to factor in was the time dilation caused by fact that New Horizons was traveling 36,000 miles an hour, so time actually goes slower on the spaceship. 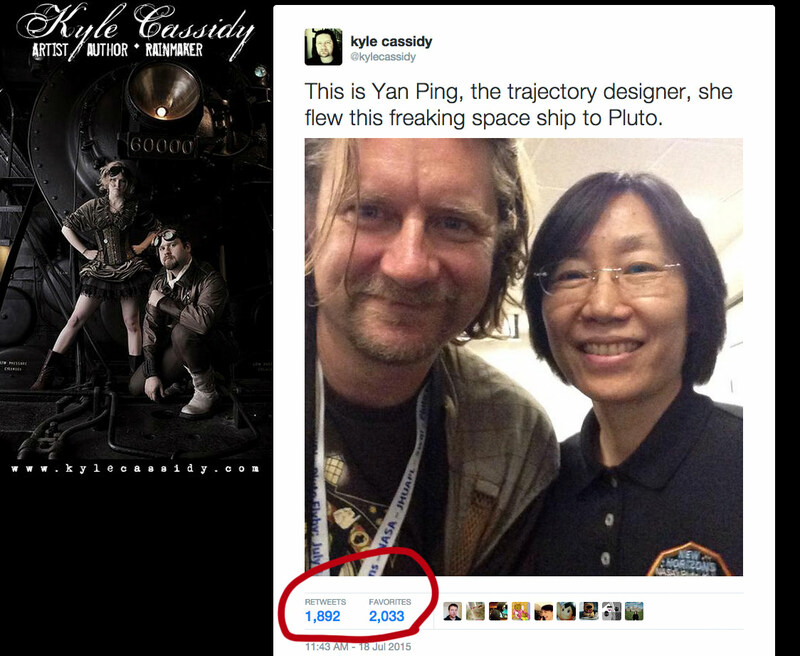 At the end of it all, after nine years and three billion miles and one whip around Jupiter (which added 9,000 mph to it's speed) New Horizons arrived 70 seconds faster than Yanping predicted, but not through any fault of her own, but because Pluto was bigger than they expected it to be. You turn on the TV and someone says "blah blah, scientists shot a rocket to Pluto" and you're like "oh, that's nice, pretty photos, ice, cool ..." but it doesn't sink in ... scientists (and engineers) shot a freaking ROCKET TO PLUTO. The scenes, you are behind them! My Leica was a point of continual interest among the scientists and engineers. One asked if I built it. The optics team discussed, at great length, how modern lenses are built to disperse less light in the rear optics of because of the digital sensors. On the left Dr. Henry Thoop plays with my camera (and is carrying some big glass of his own.) Center Dr. Brian May discuss Dr. Alex Parker's animations., and on the right, Dr. Alex Parker himself. You may clickenzee to embiggen! You may also see some of Dr. Alex Parker's celebrated animations here. My photography deals a lot with contexts, seeing people in or out of their contexts and for me, seeing these people not in mission control doing what they do, but seeing them in the really neutral environment of a studio with a simple backdrop and one light made me realize that there are very concrete individual components to "scientists (and engineers) shot a rocket to Pluto" -- individual people solving individual parts of a problem that's too big for any of them to solve alone. There are all sorts of accomplishments -- from "I got out of bed this morning" to "I worked my way through college" but when confronted with "I shot a piano sized computer three billion miles and hit a really small moving target" just pushed the needle into "there be dragons" -- I had no words. I still have no words and I've been thinking about it for two days now. Anyway, I posted a selfie with Yanping and people agreed. I've met a lot of interesting people, but not many who impressed me as much as she did. it had been retweeted hundreds of times. You may click here to make this larger! A Tumblr post of it is at the moment rapidly approaching 150,000 notes. Brian May also came down and was perfectly charming. He's been really interested in three dimensional photography and has a huge collection of Victorian sterioscopic images and so we did his portrait in 3d. I've no idea if Brian May is interested at all in talking about whether or not he'll ever get around to remixing Under Pressure the way he thought it should have been done, but I know he'll talk endlessly about 3d victorian photography and how mind bendingly spectacular astronomy and space exploration are. Guitar-shirt and all, he was geektastically indistinguishable from all the rest of the scientists and engineers down there. Photoshop and as his version is much better than mine, I reproduce that one here. Scientists make the rockin' world go round. Kate and I met up with shadowcaptain and we went off to a restaurant where I worked on picking photos and Kate typed up interview transcripts, then I got on a train and kept working on photos. Got home at midnight and fell asleep so fast I don't even remember making it to the bed (though I do remember checking on Emily the Spider who was enjoying a fly). This afternoon I talked to Slate, sent them the photos and text and did an interview. Now I'm off to bed again. It's been a crazy, wonderful weekend. I'm so glad to have been able to spend a small amount of time with some of the most brilliant people on Earth and use whatever skills I have to amplify their voice. These people are doing the most important thing that humans can do, they're trying to answer the biggest questions -- what is everything and how does it work? And they're doing it to make us all better, and it's long, hard work and the answers don't come easily. I don't know how to properly say "thank you." You can see all of the scientists & engineers I photographed here.